The hot-selling Jeep Compass SUV has just received an attractive extended warranty and a new maintenance pack. New Jeep Compass buyers will be able to opt for this 5-year extended warranty program, priced at Rs. 50,000, which also covers regular service and maintenance costs for a full five years, and offers a road side assistance package for the same period. 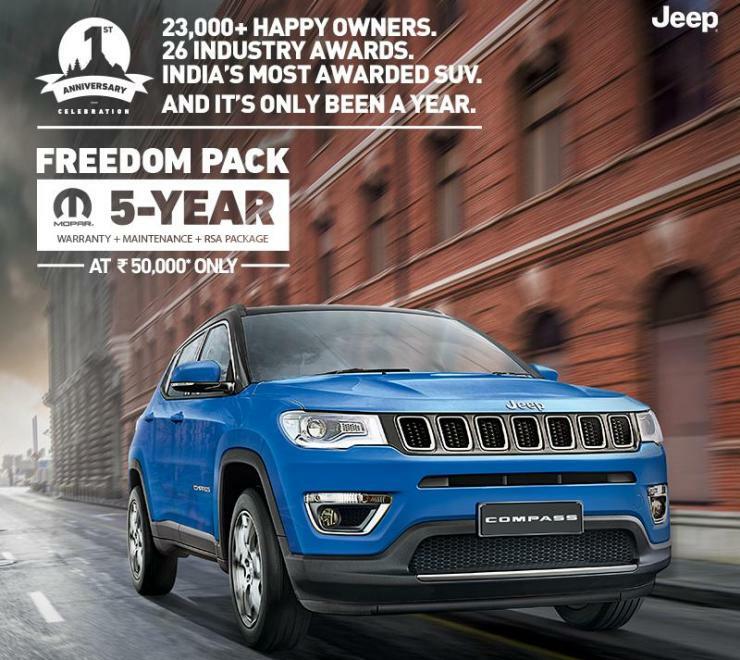 The new extended warranty and maintenance pack is called the ‘Freedom Pack’, and you can get in touch with your nearest Fiat-Jeep dealer for more details. The Jeep Compass is nearly a year old in India, and is by far Fiat Chrysler Automobiles’ most successful launch in the country, ever. The SUV has gone past the 10,000 units sales mark in India, and is clocking steady sales of about 1,500 units each month. Jeep is using the Tata-Fiat factory at Ranjangaon, off Pune, as a global production hub for the right-hand drive versions of the Compass, which are exported to multiple international markets such as Australia, England and Thailand. This strategy has allowed Jeep to localise the Compass extensively and price it attractively on the Indian market. Prices of the Compass sold in India start from about Rs. 15 lakhs, ex-showroom Delhi, for the base petrol variant. Jeep also offers diesel variants of the Compass. The Jeep Compass Petrol uses a 1.4 litre turbocharged engine with 160 Bhp-250 Nm. 6-speed manual and 7-speed twin clutch automatic gearboxes are on offer with this engine, which drives the front wheels of the SUV. The diesel motor is a 2-litre Fiat Multijet turbocharged unit with 170 Bhp-350 Nm. It gets a 6-speed manual gearbox as standard, while front-wheel drive and all-wheel drive options are on offer. Soon, Jeep is expected to launch the Compass Diesel Automatic, which will get a 9-speed torque converter automatic gearbox. The off-road spec TrailHawk version of the Compass is expected to get this engine-gearbox combination.